KeyWatcher Illuminated is a modular, scalable integrated key control and management solution that’s designed for interoperability with access control and other systems. With KeyWatcher Illuminated, access to the electronic key cabinet and to individual keys is under your complete control. You decide who has permission to remove each key, and with KeyWatcher’s advanced communications capabilities, you always know who removed any key and when it was taken. It’s the solution that gives you more value, more storage and more convenient accessibility to your electronic key management system. Using careful engineering, we designed KeyWatcher Illuminated with a modular design, so you can configure the exact components you need like key slots, card slots and lockers, with the ability to change modules where and when you need to. KeyWatcher Illuminated is scalable, too, so it can grow as your needs grow. Be sure to check out KeyWatcher Touch, the next generation key storage cabinet that builds on the success of KeyWatcher Illuminated. KeyWatcher Touch offers expanded software functionality and access-control integration, and features a robust and easy-to-use touch screen interface. 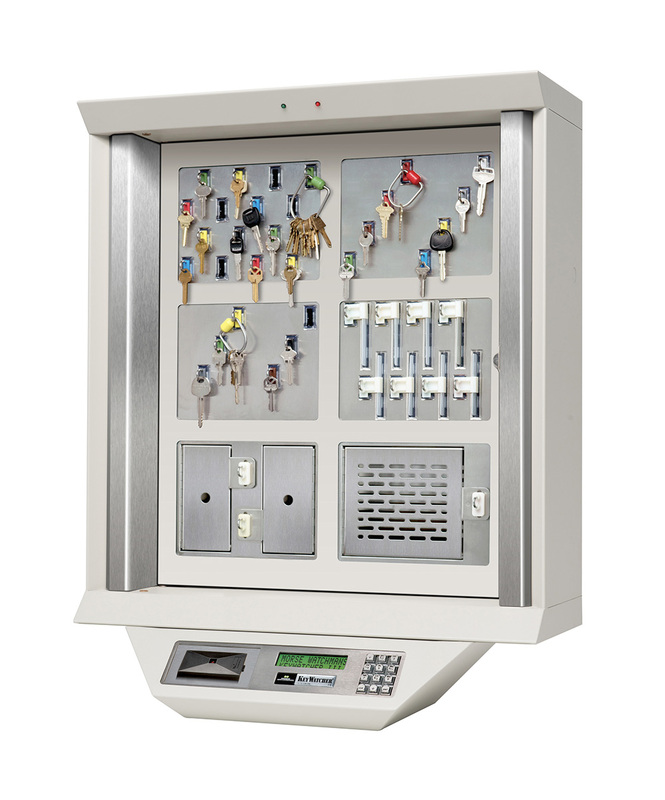 And like KeyWatcher Illuminated, this electronic key system provides users with the ability to customize key storage cabinets with different modules for keys, access cards, laptops, and handheld devices. The KeyWatcher electronic key management system provides a new sophisticated design and improved access control. Its illuminated digital key cabinet makes finding keys a cinch and provides twice the amount of storage, while using minimal wall space. Built into a rugged steel cabinet with highly illuminated key slots, the improved design makes it easier to locate keys and maximize wall space. 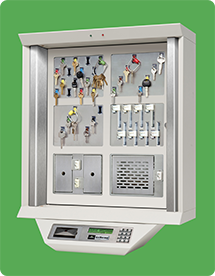 The exterior design of the digital key cabinet has been enhanced to blend in with today’s office environments, while the key control system seamlessly controls and monitors keys. Morse Watchmans engineered the keypad and control console of the new KeyWatcher system to be extremely user-friendly and accessible to the handicapped. The aesthetically pleasing, smart design actually helps to reduce wall space, while providing easier access. The KeyWatcher is powered by the same AC electricity available from your wall outlet, and features an emergency back up battery capable of supporting the system for up to 48 hours. KeyWatcher is designed for complete interactivity with your other business systems. By opening our protocols to a wide range of integration partners, Morse Watchmans makes it possible for you to implement connectivity across systems on any level you choose. For example, by integrating your KeyWatcher electronic key system with your access control system, you’ll know which users have keys and which do not. A user who has taken a specific key from KeyWatcher can be denied egress from the facility until the key is returned – and selected management can be alerted via email if a key has not been returned on time. By engineering KeyWatcher with the ability to communicate across systems, Morse Watchmans helps our customers maintain best-in-breed security solutions without the need to overhaul or replace costly installations. KeyWatcher has a built-in RS-232 communications port for direct connectivity to printers or other devices, or networked connectivity via Ethernet. With a built-in keypad and up to 2,000 assignable user codes with PINs (Personal Identification Numbers), KeyWatcher provides unmatched flexibility. The system allows security managers the discretion to appoint one of five different levels of access for each employee. In addition, it offers the expandability of interfacing with a variety of access control devices. The illuminated two line by 16 character screen clearly displays messages and user prompts for a variety of different functions, including removal and replacement of keys. Built using stainless steel, the cabinet is designed to resist abuse and is wired with a tamper- proof mechanism. The alarm sound emanates from the KeyWatcher and can be wired throughout the facility and other sounding devices. Any PC with speakers running KeyPro software can emit an alarm as well, and alarms can be sent automatically via email to designated managers.